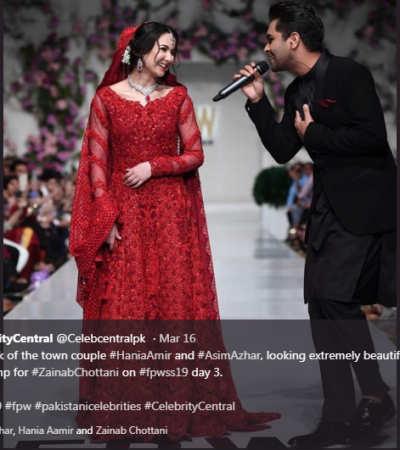 Karachi, The elegant fashion show, Fashion Pakistan Week was ended in Karachi and the dresses of different fashion brands are being discussed along with the friendship of Asim Azhar and Hania Aamir. This fashion show was continued for three days and it got the attention of the people and the friendship hot news of Hania and Asim also remained the focus of the participating people. 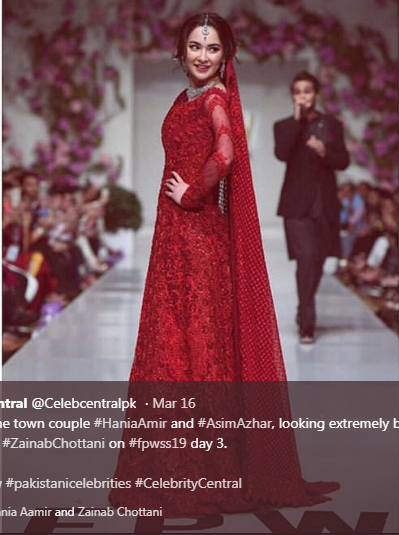 Actress Hania Aamir was dressed in the bridal dress having red color designed by the leading fashion designer, Zainab Chotani and she stole the hearts of the audience. When Asim Azhar gave the entry in the romantic style, then the audience gave big clap over his romantic song. Hania was looking shy and the audience got the enjoyment over their style. 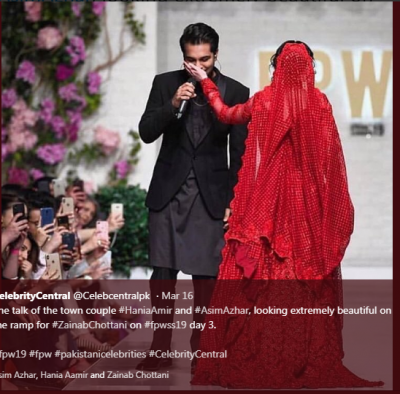 The wonderful dresses of the participating designers of Fashion Pakistan Week got the appreciation and they also like the couple of Hania Aamir and Asim Azhar. The video, in which Asim was singing the song for Hania got viral on the social media. Various other pictures of this couple are also getting viral on the social media, in which they hold their hands and they are looking in very exciting mood.